*astonishingly* “What does it mean?” he asked. Here is my answer to little champ eating Peanuts. Data Science is about finding the TWO peanuts that you lost on the DIRTY Corridor. He “Wow! It’s so simple, Mamu. I thought you are doing something great”. Rest of the explanation is for you. Why is Data Scientist in Demand? What are the Skills required for Data Science? Beware! Nowhere you will find this definition and don’t use it. This stats will blow your mind. There are 1.5B personal and 5M business users globally on Gmail. Google blocks more than 99.9%of spam, phishing, and malware from reaching your inboxes, every day, every moment. 99.9% of spam data is ENORMOUS. It means Google makes their business with that 0.1% remaining. The science behind finding those 0.1% valuable information is Data Science. And the engineers responsible for extracting that 0.1% information are Data Scientists? Why is Data Science / Data Scientist in Demand? Data scientist are extremely in demand nowadays in the field of information and technology. The data is being generated in huge quantity every second. The incorporation of data and growing data in vast quantity has created fresh opportunities for the people who like for play with the information. Who Else Want To Become A Data Scientist? 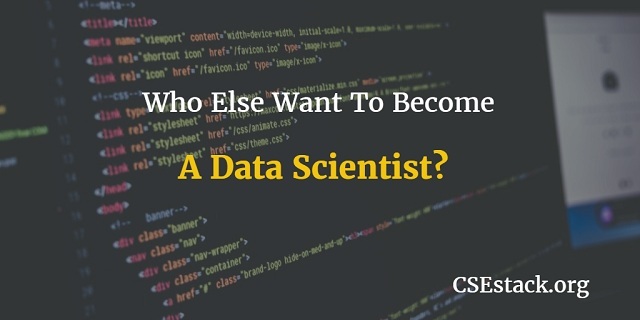 What does data scientist do and how can you become a data scientist? Well, we are familiar with data but the job of data scientist is to be better in the statistics than any other software engineer. You can have data without information, but you cannot have information without data and statistics. Quote from Daniel Keys Moran (Programmer and Science Fiction Writer). This is the reason why we need a data scientist. They help business persons to evaluate the data and generate business intelligence forecasts. Let me start taking your question: how do I become a data scientist. If you are Google Engineer, here is how you will use the following skills to filter out all those spam data. Here are amazing techniques for you for becoming and perusing the data scientist career. If you want to become a data scientist you need to polish your statistical and mathematical skills. You also need to learn advanced mathematics because at some level of data statistics general mathematics doesn’t help for analysis. So start practicing mathematics and statistics. A good data scientist is the one who knows how to apply the algorithms, reasoning and linear equations on data for the best outcome. The good data scientist is one who questions everything and calculates the answer from the departure of the flight to the landing timings. So polish up your questioning skills. And make sure you have the passion for data science in you. Without the passion for calculation of data, this field as a career is very dry. If you have passion, you can earn more satisfaction than the amount as your income. You need to learn the basics of data for becoming the data scientist. Get the proper knowledge about the machine languages, programming language Python, and other coding languages. Python is the most suited language as there are many Python libraries available for Data Science. You can explore them for Free. You have to be perfect in databases; the tools which are used for databases and how to use analyses and extract the data from the database. A data scientist should have the perfect and keen knowledge of the database. You need to learn the data cleansing and data mugging methods. You have the raw data now you need to mug and cleans the data from raw to convert it into use full relevant data. You need to learn about data managing techniques. Once you have mastered the above-mentioned data managing techniques, now it’s time to learn about the big data, Hadoop techniques. Everyone is talking about Big Data. Big Data is growing enormously; it seems to be an emerging career path. The big data is the main concept for a data scientist to learn. Understand the Data Pyramid model. In big data, the data scientist will refine the data of all type, including text, videos, audios, and other data sources into their business intelligence system and make the statistic report. Keep practicing your approaches towards data sciences because your practice will make you perfect in your field. Join the data scientist community for keeping your self-updated with the data science researchers, technologies, and latest discoveries. For the career opportunity join the data science, boot camps or internship programs such programs can lead to you data scientist professional job. And lastly, follow the community of data scientist it will keep you updated and informed. This is all about prerequisites skills required for Data Scientist. These skills also fulfill the data scientist job requirements. Do you have any question or any related to discuss? Let’s start a discussion in a comment. She is working as a Senior Data Analyst at Assignment Star. Apart from being a professional Data Analyst. She also has vast experience in business intelligence and developing strategies for small businesses.